A walk on the premises usually begins with an appointment - an email or a telephone call to ask if a Eurodressage reporter is welcome to have a stroll on the property. As Silke Rottermann recently did an in-depth article on Colonel Christian Carde in Saumur, it seemed obvious to kill two birds with one stone and show the readers the work and facilities of the Cadre Noir. 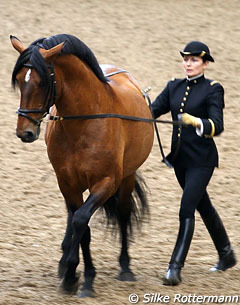 The Cadre Noir is one of few remaining academic dressage schools in Europe, but unlike the Spanish Riding School (SRS) it has a military background. Here is Silke's report of her walk on the premises of the Cadre Noir. I asked my dear Swiss friend Joy, who I was going to visit in Paris and who speaks French fluently unlike me, to call the institution to ask for an appointment. The following two days Joy did her best to make one and finally spoke to the ecuyer en chef, Colonel Jean-Michel Faure, who told her the Cadre Noir would have a final rehearsal on Thursday 4 November 2010, which would give us an excellent opportunity to gain insight in its work. The very same day Joy made an appointment with Colonel Carde for me and when she mentioned we would like to visit his former riding group as well he promised to arrange it for us and was true to his word. So we headed off to Saumur with two appointments in our pockets. To the French, the art of riding is an essential part of life. French children enter into pony clubs the same way kids in the United States join soccer or baseball teams. 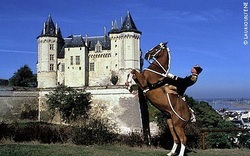 It is integral to the French culture, and the keepers of that culture are trained at the Ecole Nationale d’Equitation in Saumur, France. While better known for the Cadre Noir performance team, the school is first and foremost a place of teaching and education. In fact in France, one cannot be hired as a trainer or instructor without having graduated from the school. This prestigious school can have more than one hundred applicants for fewer than 15 spots. test, the jumping test, the cross country test,” he said. When Cousyn was attending the Ecole Nationale in the late 1980s, the school days included classes in training & riding in four disciplines: dressage, show jumping, eventing and young horses. Formal classes began early in the morning, around 8am, and include a “young horse” class, but the day began as early as 7am with grooming and care of the horses. Students are given a five year old at the beginning of the school year, and are expected to show the young horse in a three day event by the end of the year. Afternoons are usually filled with theory classes in each discipline as well as the teaching classes, where students are taught how to teach the theory and lessons. Each day they took up to five different lessons with five different instructors all expert in their own field. The school year lasts from September through August. The philosophy of the French method is, according to Cousyn, based on a series of steps, a sort of building block foundation for the horse and the rider. “At school we really focused on the basics, to have a structure. You know you do step one, step two, and you don’t go to step two unless you have step one,” he says. “It was very very articulate, it is easy for the horse to do. 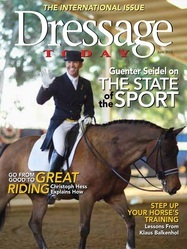 We have a map already.” This map is essential to teaching, he says, and the lack of a basic foundation can lead to more problems at the higher levels of dressage and eventing. This formal education system and the lack of emphasis on showing and performance are key differences between the French methods of training and those in the United States. In the U.S., Cousyn says he sees a larger emphasis on show results, which puts pressure on trainers to perform instead of giving them time to teach and train .